The deadliest road in Scotland can be found in Orkney, figures have revealed. A map of the most dangerous roads in Britain has been created using using fatality data gathered by the Department of Transport and the Police Service of Northern Ireland over a five-year period. 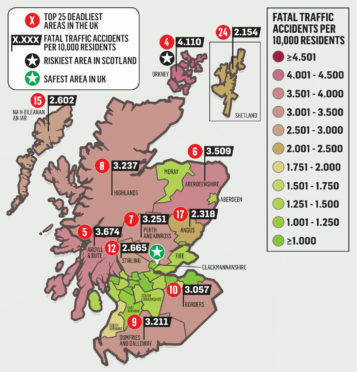 The rate of accidents per head of population has been found to be highest on the A965 Kirkwall to Stromness, making it the fourth highest in the whole of the UK. The odds are partly affected by Orkney having a smaller population. Between 2012 and 2016 there were 4.110 fatal traffic accidents per 10,000 residents. Argyll and Bute with 3.674; Aberdeenshire, 3.509; and Perth and Kinross, 3.251; had the next highest rates in Scotland. The figures came from the A83 Tarbet to Campbeltown road in Argyll, the A90 Perth to Fraserburgh in Aberdeenshire and the A9 in Perth and Kinross. Highland was fourth in Scotland, with 3.237 on the A9. Scotland’s smallest county, Clackmannanshire, was named the safest area in the UK and recorded no fatalities during the period. Margaret Dekker, researcher for the Scottish Campaign Against Irresponsible Driving, said: “There are a lot of issues here. A graded licence scheme for younger drivers has been talked about for years, I don’t know what’s holding that up. Young drivers would not be allowed to carry passengers in the evening. “This figure is worrying for Orkney and the other areas. It is just so sad. June Ross of Stone Gables, Alford in Aberdeenshire, lost her son Ian Buchanan, 22, in a crash in 2010. She launched the Don’t You Forget About Me support group to help other grieving families and friends. She said: “I’m quite surprised but I’m not surprised, it’s a mixed feeling. Aberdeenshire is dreadful. “Some of the roads are just incredibly frustrating for everybody, with farm vehicles at rush hour. They don’t seem to be improving at any rapid pace. “They are very dangerous roads, people who are travelling on them often travel fast because they know the road. “There are a lot of places where the signage could be a lot better. The fatalities are probably still the young folk and the speeding.